Bikes can bring back memories of childhood and learning how to ride for the first time. Some people grow out of riding bikes while others continue until they pass away. Although bmx bikes, mountain bikes, racing bikes etc.. can be very fun to ride, they’re also incredibly awkward pieces of machinery. If you’ve ever tried to find a storage space for a large bike, then you’ve already experienced the feelings of frustration that come along with such a task. Fortunately, you have options, and there are hundreds of different bike racks to choose from. Some of the best racks are designed for use in a garage and allow you to store your bike in a vertical or horizontal position. One of the greatest benefits of owning a garage bike storage rack is the extra space that it provides. Garage racks can allow you to store your bikes in places where they wouldn’t normally fit without a rack, which is a huge advantage. Once you’ve installed a rack, you’ll have more free space in your garage for other belongings. At first, they might seem complicated, but bike racks are quite easy to install. Most racks can be installed with sturdy bolts and require only a few minutes of your time. Below, you’ll find reviews for some of the best garage bike storage racks available, and by picking a product from the list, you can save money and time. If you have a large family and need a way to store several different bikes, then this rack is worth considering. With a total of five bike holders, you’ll have plenty of room for several bikes. 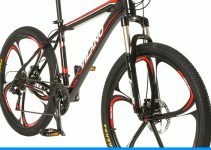 For maximum durability, the entire rack is made of powder-coated steel, and it should have no trouble withstanding the abuse associated with loading and unloading bikes. 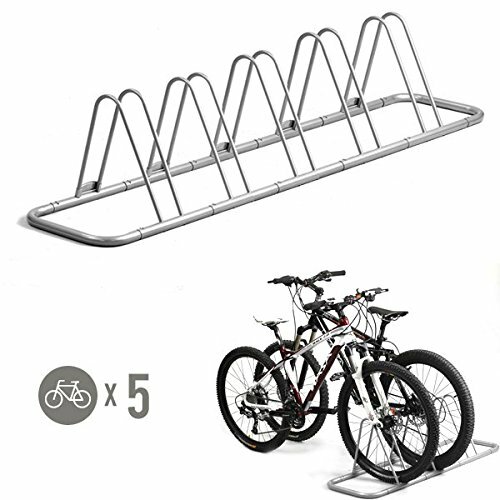 Depending on your preferences, you can use this bike rack as a single piece, which can hold up to five bikes, or you can separate the rack into five individual pieces, which yields five individual racks. The individual pieces are designed for easy separation, and the total weight of the rack is 10 pounds. The rack is made in Taiwan and comes with a one-year warranty. This product is engineered for safety and can be used to store up to five bikes inside of a garage. Each individual rack can hold a large or small bicycle. 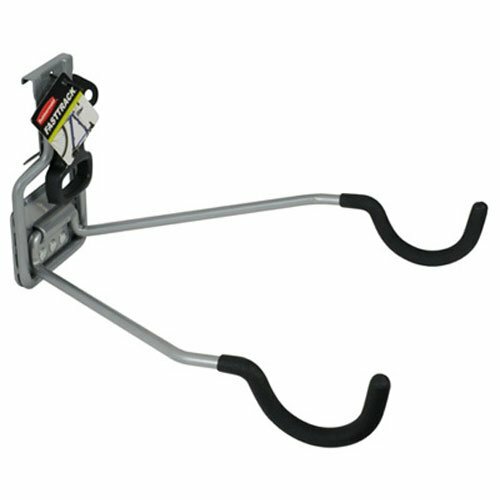 The RAD Cycle Products lift hoist is another popular bike rack for garages. It has hooks that are designed with a rubber coating, which will protect your bikes from scratches. With robust engineering, this rack is made to lift heavy bikes, and it has a total weight capacity of 100 pounds. It can be installed on ceilings that are no higher than 12 feet, and to prevent accidental release, it has a safe locking mechanism. This rack is specifically designed to deliver better quality than similar products. 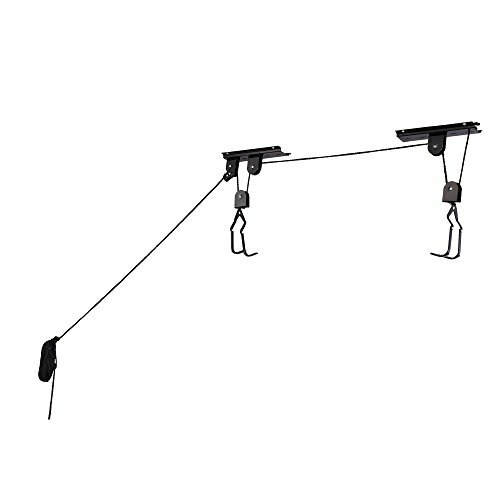 For a stronger product, the hoist is made with thicker rope, and the whole system comes with a lifetime warranty. This hoist can be used to store bikes overhead and keep them out of the way. 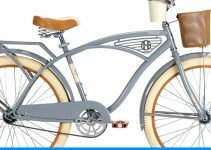 It uses smooth latches and pulleys, which have no trouble lifting a heavy bike. A rope locking mechanism prevents accidental release of the bike and can hold 100 pounds. 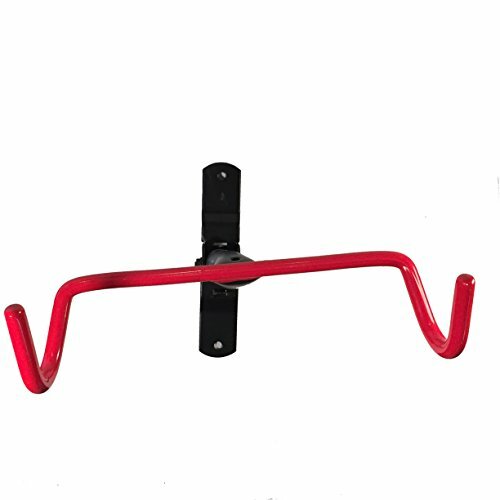 This bicycle rack can be used in almost any garage or shed, and it’s made of strong steel. It has a total load capacity of 30 kilograms and features stylish black coloring. The rack is designed to hang a single bicycle in a vertical position, which is great for saving space. The hook that is used to hold the bike has a sponge cover, and it helps to prevent the wheel from scratching. 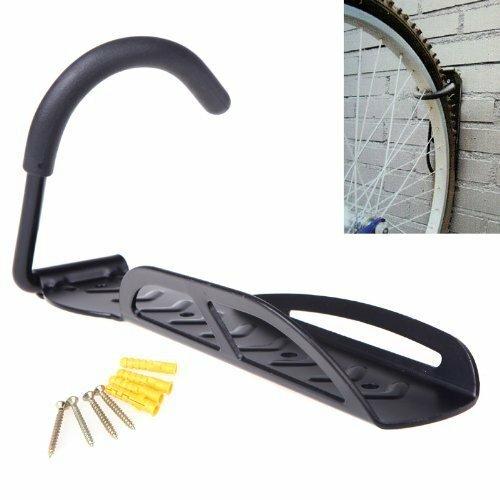 The HOMEE bicycle rack is made with a safety locking mechanism and prevents the accidental release of the bike. Although it’s commonly used for mountain bikes, this rack is suitable for all types of bikes. If the wall is strong enough, the rack can hold bikes that weigh up to 60 pounds, and it comes with all the hardware needed for the proper installation of the rack. Some of the best bike racks can be mounted to a wall in the garage, but there are other great types of racks. The Racor Pro PLB-4R is a freestanding rack, and it can hold up to four bikes. It features a compact design and can free up a lot of space in a garage. Depending on your needs, you can choose from two different models. One rack holds two bikes, and the other holds up to four. The Racor Pro PLB-4R offers level bike storage, and it can hold several different types of bikes. The assembly process is easy and doesn’t require any tools. Since this is a freestanding bike rack, it’s engineered with a tubular steel construction and has a durable epoxy finish. If you don’t want to place this rack on the ground, you can use the included screw to mount it onto the wall in your garage. Here we have another popular garage bike storage rack. It’s ideal for storing a bike in an apartment, garage or home, and it features a patented design. When the rack isn’t in use, it can be folded up and kept out of the way. When you need to perform repairs on your bike, this rack doubles as a designated repair stand. 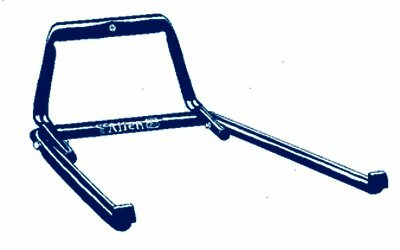 The Allen Sports bike storage rack can be installed with a single wooden screw, and it comes with a lifetime warranty on the materials and workmanship. It’s designed for residential use and arrives fully assembled. With a streamlined design, it requires only a single screw for installation. To reduce the obtrusiveness of the rack, it folds up when it’s not in use. The rack is made from materials that are zinc plated and corrosion resistant. Although this product serves as a reliable bike rack, it’s also useful as a repair stand. If you have several bikes that you need to store inside of your garage, the TidyGarage bike rack is worth considering. Since it’s a wall-mounted rack, you’ll need to install it onto your wall. It’s recommended for larger families because it can hold up to four bikes. 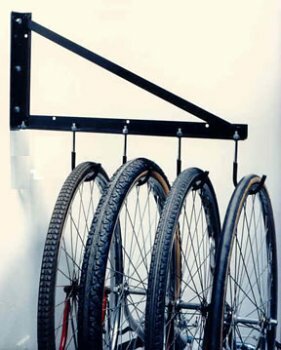 The TidyGarage bike rack is designed to hold bikes in a vertical position, but if you want to hang your bikes in a horizontal position, you can purchase two of the racks and use them together. With a heavy-duty, white powder-coated steel frame, this rack is designed to withstand the abuse of loading and unloading large bicycles. To prevent damage from occurring, the steel hooks are coated with vinyl. This rack comes with the hardware needed for installation and doesn’t take long to install. The TidyGarage bike rack can work great for large families, but it’s just as useful for couples and can even be used to hold a single bike. If you decide to expand your family, the rack is ready to accommodate more bicycles. The Rubbermaid FastTrack bike rack can be used to conveniently store bikes and keep them up off the floor. It’s designed to protect against unintended accidents and allows you to reclaim the parking space within your garage. The hooks that hold the bikes are coated with soft gripping material, which prevents scratches and nicks. With the FastTrack mounting rails, the rack can be snapped into place quickly. However, the mounting rails are not included. This garage bike rack can hold up to 50 pounds, and with the right hardware, it can be mounted directly to the wall in your garage. You’ll need to purchase the mounting hardware separately. You can use this rack to store a single bike horizontally, and it’s capable of holding most bikes that have a frame size between 12 and 26 inches. If you’re looking for a product that includes everything needed for the installation, and you don’t want to purchase separate parts, this might not be the best choice. The Delta Michelangelo rack can be used inside of a garage, and it’s designed to lean against a wall. Unlike some of the other bike racks on the market, this product doesn’t require any attachments. To accommodate all types of bikes, it has arm components that are easy to adjust. 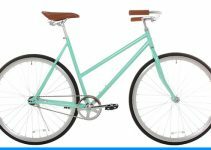 With a maximum load capacity of 80 pounds, this rack can hold two large bicycles. The Delta Michelangelo bike rack is made from premium materials and features a powder-coated finish. Since the required hardware is included, the rack is very easy to assemble, and most people should be able to put it together within minutes. It’s ideal for garages but can also be used in apartments. This rack is ideal for use in areas where space is limited. Most people are shocked when they see how much space is saved by using vertical storage. The Delta Michelangelo bike rack also has rubber feet, which protect the wall and floor. The Clarian bike rack is made of solid steel construction, and it has a total load capacity of 66 pounds. To prevent unwanted scratching, it has rubber coating in high-risk areas. When the rack is not in use, it can be folded upwards, and it comes with two sets of mounting hardware. It can be installed onto wood studs or hollow walls, and it will hold all types of bicycles. The Clarian bike rack is especially useful for road bikes, folding bikes, beach bikes and mountain bikes. Since it comes with a lifetime guarantee, it’s easy to see that the company stands behind its products. If you’re looking for a way to store your bikes with confidence, this rack is worth considering. The rack is made of durable steel and has rubberized coating on critical areas, which prevents your bike from getting scratched. When the rack isn’t in use, it can be folded upwards, and the included heavy-duty mounting hardware allows the Clarian bike rack to hold even the heaviest bicycles. The Presa CP40005 heavy-duty bike racks are designed for bike storage, and they’re ideal for use in a garage. If you’d like to store bikes on the ceiling of your garage, these hooks can help. However, they’re not limited to bicycles and can also be used for garden hoses and lawn furniture. 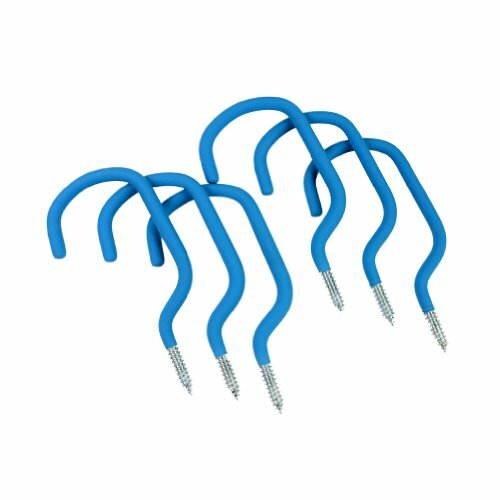 Each hook has a soft, non-slip coating, which helps to protect your bike. The Presa CP40005 bikes hooks can be installed within minutes, and each hook can hold up to 105 pounds. Since they’re made from galvanized steel, they’re incredibly strong and reliable. With the purchase of this set, you get a total of six hooks, which is enough to hold several bikes and lawn furniture.